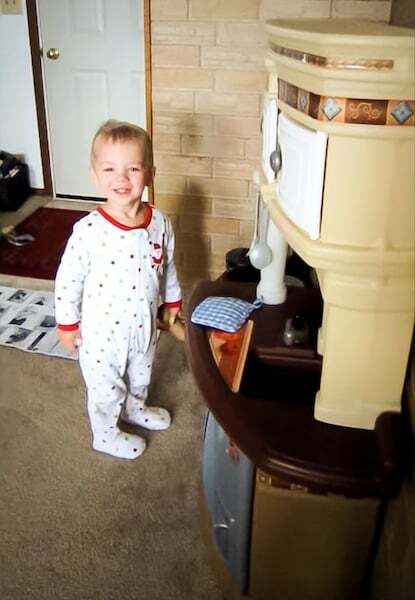 Have you ever found a gift for your kids for Christmas, but ended up giving it to them early? I'm so guilty of that! That's what happened with this amazing Step2 Master Chef Kitchen. 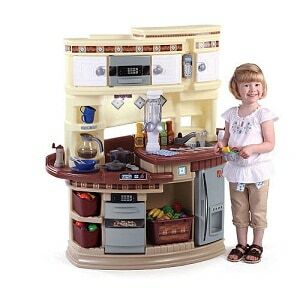 Marybeth's note: The model of the Step 2 Lifestyle Kitchen featured here has been discontinued. But honestly, I think the one that's now available is far better and it's even a lower price! All links have been updated to the newer model. When Step2 sent the Step2 Lifestyle Kitchen to us, I had full intentions of taking it out of the box, inspecting it and putting up a comprehensive review so you all could see the ins and outs of the set before making your decision to buy it or not. My plan was to then stash it in the basement and bring it out for Christmas. Well, my husband put it together and game me a demonstration of all the amazing features, and I just couldn't wait to give it to Haiden and Piper to play with. Since James was going to work and wouldn't see their initial reaction, he asked me to make a video of it. I'm so happy I did! Want to use salon-quality hair dye at home? Read my Madison-Reed review! Feeling crafty? See if a Cricut is for you in my Cricut Explore Air 2 review! I have to say, we've had this kitchen assembled and out for playing for two weeks and Haiden and Piper play with it every single day! The video just doesn't do justice to the multitude of fantastic features the kitchen has! Here are my top 5 favorite things about the Step 2 Lifestyle Master Chef Kitchen. 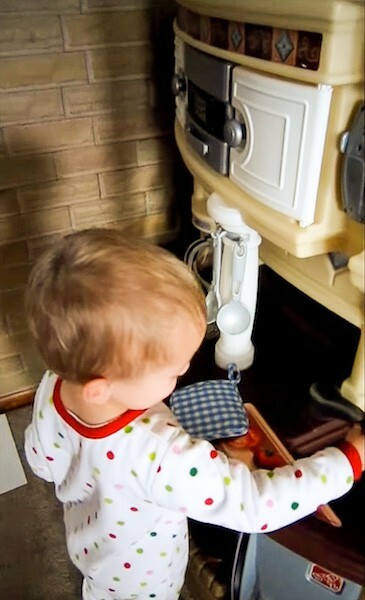 The lights and sounds of the play stove: Two of the included accessories are a pot and a frying pan. If you put the pot on the stove the burner lights up orange and makes bubbling noises. If you put the frying pan on the stove the burner blinks orange and makes sizzling noises. It's so much fun to demonstrate what different pots and pans are used for! 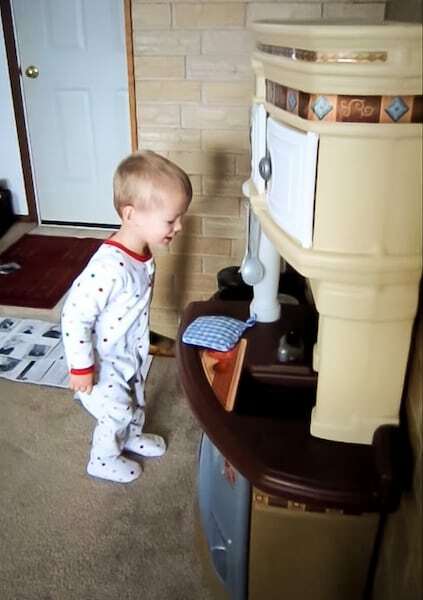 The sound effects of the microwave: The control panel of the microwave has buttons that beep and make all sorts of noises when they're pushed. It's very realistic! The multitude of included accessories: In addition to the pot and the pan mentioned with the stove features above. It also comes with 34 other kitchen tools, dishes, utensils and other accessories for realistic cooking adventures! The set comes with everything my kids need to make and serve pretend meals. The 36-piece set makes the kitchen all that much better! 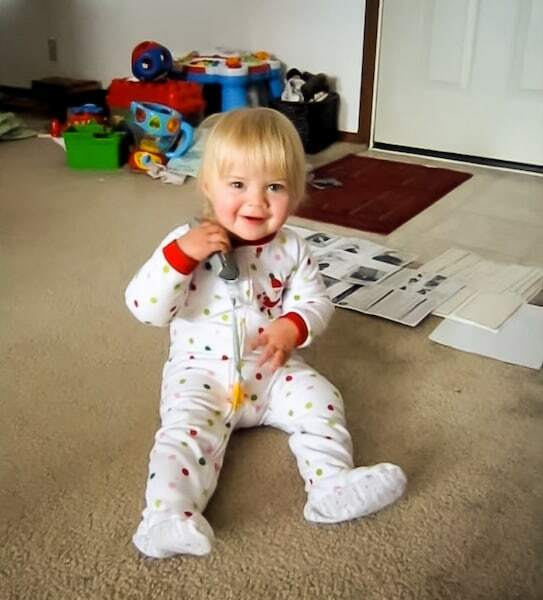 Piper's favorite accessory by far is the cordless phone! The modern design: I routinely overlook the aesthetic value of toys because they're, well toys. The toys that my kids use and love are definitely made to be attractive to them, not to me! The Step2 Lifestyle Master Chef Kitchen has a neutral brown, white and tan color scheme with “stainless” appliances. It even has chocolate-brown “granite” countertops! The kitchen has been in our living room for two weeks and it actually blends in somewhat with our walls and furniture! That's a great feature when you don't have a dedicated playroom to put the big toys like this one! The extensive storage: Like I said, this play kitchen comes with quite a few accessories. really through it through by providing cabinets, a tub and two storage baskets to stash everything with room to spare! I love that we can pick up everything at the end of the day and actually put all the accessories away inside the toy. It helps to keep track of all the pieces, and it helps me keep my living room a bit neater. 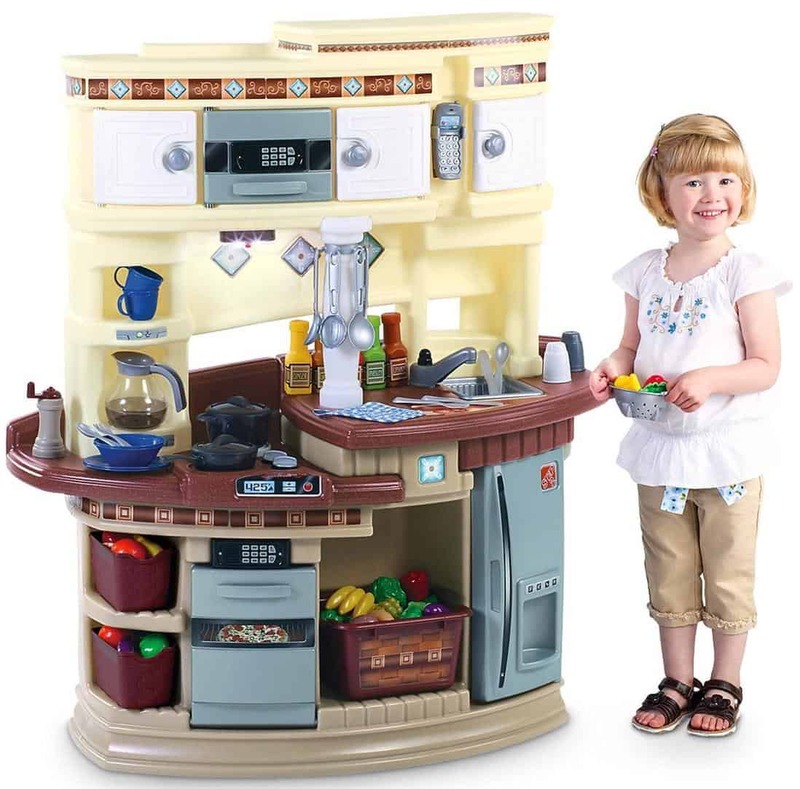 While I 100% that the Step2 Lifestyle Master Chef Kitchen is an amazing toy, I do have one opportunity for improvement: with the exception of the removable cordless phone, the two electronic controls that beep and make noise are both on the left side of the kitchen. Speaking from experience, the kitchen itself is definitely big enough for two kids to play together while standing in front of the countertop. Unfortunately, I've had to deal with a few sharing problems because both Haiden and Piper want to be on the left side where the “action” features are! 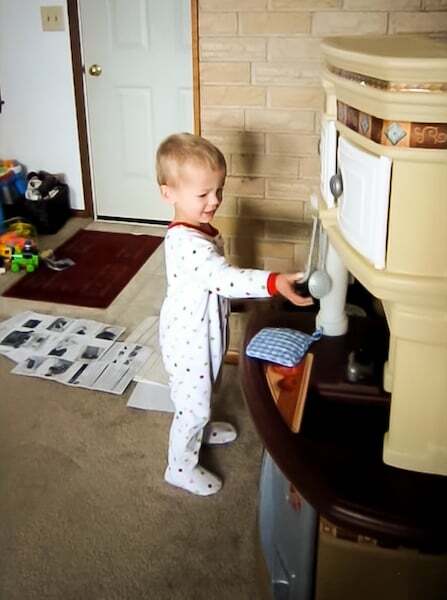 I know they'll be more interested in other, less flashy features as they get older, but it's hard for a toddler to pretend to wash dishes on one side of the kitchen while the other one is pushing buttons in two different places on the other side. Finally, a question that you might ask is, How long does it take to assemble the Step2 Lifestyle Master Chef Kitchen? My husband put it together in just over an hour. Overall, I don't think that's too long of a timeline with a big toy like this one! He does recommend using a drill or an electric screwdriver to speed up the assembly process and make sure all the pieces are securely attached. It also requires several AAA and AA batteries, so be sure you have them on hand to complete the package! All in all, I am so pleased with the construction and performance of the Step2 Lifestyle Master Chef Kitchen! It's an amazing toy that I'm hoping Haiden and Piper will play with for years! Want to buy the Step2 Lifestyle Master Chef Kitchen? The model pictured and reviewed is no longer available but I've updated the links to a similar model on Amazon. Thank you to Step2 for providing the Master Chef Kitchen for my family and me to review. I was not paid for this review and my thoughts and opinions expressed in this post are my own. Your kids are so cute in the video! If you worked on your video-making skills they could be movie stars! It was fun to see you demonstrate the little things the kitchen does. Thanks for including the YouTube.